"Sicario" features a brilliant role for Emily Blunt as an FBI agent who volunteers to catch the leaders of a drug cartel together with undercover agents. The "Alliance of Women Film Journalists" nominated her as "Best Female Action Star" of 2015. Directed by Dennis Villeneuve, "Sicario", which means hitman in Spanish, premiered at the Cannes Film Festival in May and was nominated for a Palme d' Or. The theme of the film - the pursuit of drug dealers by the means necessary to cut off 'the head of the dragon' is illustrated visually. As one head goes, violence erupts like firecrackers in Juarez, Mexico where Emily Blunt as agent Kate Macer is recruited for work. She is there to make the op legit in the unorthodox manner undercover agents go about trying to topple pushers and their regime. Two agents buddy up with her on the job: Alejandro , a rogue agent played by Benicio Del Toro who has lost his family to dealers and FBI agent Matt Graver played by Josh Brolin willing to bend the rules and look the other way. Both Alejandro and Graver work their agenda on Macer. Icelandic composer Jóhann Jóhannsson has created a brilliant musical score in this game of violent high stake pursuit. Behind the camera is Roger Deakins ("Skyfall") who creates some amazing night vision scenes and digital mapping of the terrain where drug runs are made. Kate Macer (Blunt) does not seem suited for the job; she is often afraid and unsure of herself but eventually she learns why she is attractive to the FBI. 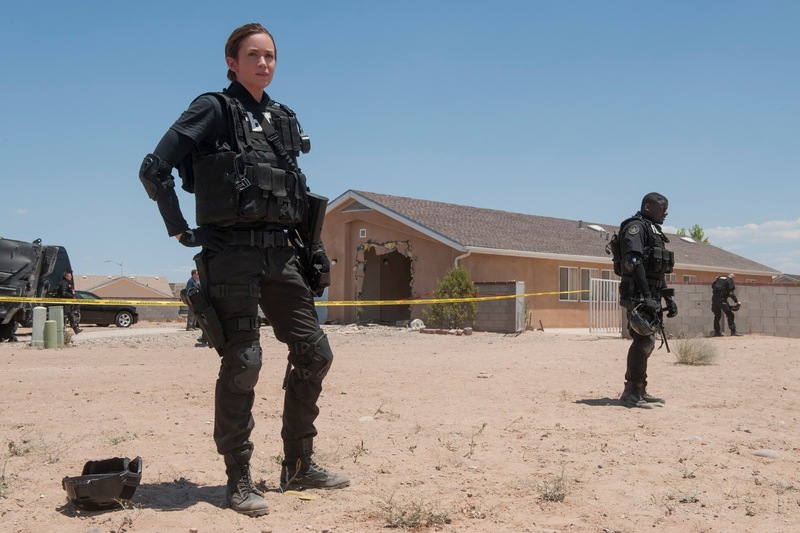 "Sicario" is not a pretty picture of legitimate law enforcement cracking down on dope pushers; it shows the viciousness and ruthlessness of the life style, of innocent victims and the families who become involved in this destructive way of life. Director Dennis Villeneuve creates this narrative in a smooth way with plenty of contemplative spaces. It is not an action film as much as an authentic study of the drug business and the tragedies of lives touched by drug trafficking on both sides of law enforcement and dealing.